The sails were the product of the Old Technology, lost long ago in the depleted Earth, and they were priceless. For with those fantastic sheets of etheric material, ships could sail the sky and even brave the radiant tides between worlds and stars. The alchemists who had replaced the scientists still sought the ancient secrets…and Rachad, apprentice to such a would-be wizard, learned that the key to his quest lay in a book abandoned in a Martian colonial ruin long, long ago. But how to get to Mars? There was one way left—take a sea vessel, caulk it airtight, steal new sails, and fly the star winds in the way of the ancient windjammers. 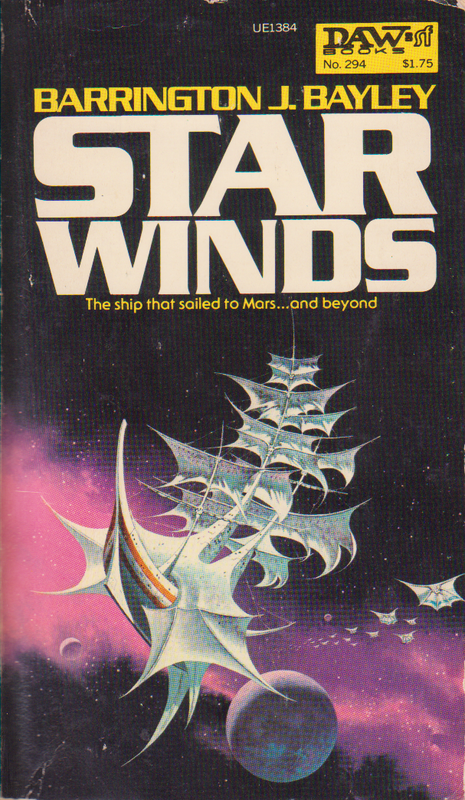 Here is an intriguing, unusual and colorful novel of ships that sail the stars riding before the solar breeze that blows between the worlds. So he sent me this stack of almost twenty books. This is one of them. I picked it because it has a picture of what looks like an old-timey sailing ship that has been refitted to travel through space. I don’t know about you guys, but that kind of thing is just awesome to me. I don’t know what it is about that particular trope, but it never fails to fire my imagination. You’d think if I were into that kind of thing I’d be into ideas like steampunk, but no, I’m not especially a fan of steampunk. I also picked it because the author has the whitest name I’ve come across on a science fiction novel since Cecil Snyder III. It turned out that yes, the book does have old-timey sailing ships refitted to travel through space. Well, ship. One ship. And it doesn’t make it most of the way through the book. I was gravely disappointed in this novel. It had so much promise but none of it came through. It had space alchemy, guys! I’m trying to think of how to describe this kind of literary device. It goes something like “In the far future, science has turned back into its progenitor magical arts, but since science got further than it currently is before that happened, the magical arts kind of work.” Does that make sense? It’s a sort of inversion of Clarke’s “Sufficiently advanced technology,” except in this case it’s like the sufficiently advanced technology has all but disappeared and its inheritors use it in a manner similar to magic. This is something I like. I think it has potential. This book squandered a lot of that potential. It starts off on Earth. Rachad Caban is a standard roguey-type character. He occasionally goes to a dude named Gebeth, an alchemist, to learn a little alchemy, but that bores him like most other things. He’s not got much in the way of direction in his life, does Rachad, but he soon learns that adventure awaits! Hooray! See, Gebeth has knowledge that a tome of ancient alchemical wisdom exists. It holds the secret for creating The Philosopher’s Stone, which does all the things that you expect it to. Lead to gold, long life, something about Voldemort, the works. He wants Rachad to go get it. The only problem is that it’s on Mars. It’s never stated when this book takes place, but it does mention offhand Nicolas Flamel and that he lived about 4000 years previous, which would put this book somewhere in the 5300s, probably. Earth is now a backwater planet that nobody gives a crap about. I guess it no longer has anything worth trading with the rest of the galaxy, but it used to be a galactic power. Later in the book it’s even stated that Earth isn’t even known as the birthplace of humanity anymore and people speculate on where humans actually came from. The first time I encountered that idea was when I first read Foundation as a teenager. I liked it then. Anyway, part of Earth’s problem is that it’s too close to the sun to produce “etheric sails.” They are, I guess, an alchemical creation, but something about proximity to a star causes them to fail to crystallize properly or something. Etheric sails are necessary for all space travel, since they catch hold of the solar wind and use it as a means of propulsion. They’re even useful for regular old air travel, which is all they’re used for on Earth now anyway. There’s no means of getting new sails (on Earth, anyway), so the ones they have are precious and some are hundreds of years old. So the way Rachad figures he’ll get to Mars is to stage the first interplanetary voyage in generations. He cons this guy named Zhorga, captain of a ship named Wandering Queen, into converting his ship into a spaceship. Rachad tells Zhorga that there’s a good chance that Mars has a whole bunch of etheric sails that he can trade for, which he can then bring back and sell for an exorbitant price and get really rich. The only catch is that Rachad has to come along and he has to be able to search for this book. The first half of the novel is adventure on the high space seas. It’s a heck of a journey getting to Mars, full of danger and setbacks and orbital mechanics. At some point in there I got bored and started thinking about whether Magneto has enough power to adjust the Earth’s orbit to any significant degree. I haven’t done the math yet, but I bet he does. The journey to Mars wasn’t all that exciting except for the part where there were alchemical monsters (space squids, in fact), and a couple of mutinies that didn’t go anywhere. But, and this is a big but (I like them), I felt like it was going somewhere. There was a distinct feeling of this is gonna be good. Mars is even worse off than Earth. It’s a wasteland with ruins and savages. We learn this after the ship crashes into Mars. Unlike some space agencies I could mention, it wasn’t due to a unit conversion error, but rather to a very large ship in Mars orbit that shoots them. The ship is the Bucentaur and it’s run by Baron Matello. We learn this after the Baron sends some folks down to look for survivors. Captain Zhorga joins with the Baron almost immediately, whereas Rachad has some reservations. “I withhold this decision until you give me an appropriately-sized exposition dump,” he might as well have said. “Cool,” the Baron might as well have responded. The exposition turns out to be of the appropriate size and it all boils down to the fact that Baron Matello heard about the book on Mars as well and came to look for it because he has plans of his own that don’t actually involve turning base metals into gold. One of the things I liked about this book was the gradual widening of scale for us and the characters. At first all they (and we) know is Earth and its situation, then they go to Mars, and then the whole galaxy opens up and there’s this wide open setting with a galactic war and monarchs and aliens and even more alchemy the likes of which Rachad has never even dreamed. It’s straight up Hero’s Journey stuff, I guess, except in this case it’s the Wandering Observer With No Agency’s Journey. Still, it’d make for a decent video game setting. So the reason Baron Matello wants the book is because some Duke is into alchemy and Matello needs an excuse to get into his impregnable fortress and take it over. The fortress is named The Aegis and it was made by some alien who never got paid for it and so he’s mad too. The Duke of Koss walled himself off in The Aegis and refuses to come out and help mankind against its foe, the Kerek, a race that apparently just likes to kill stuff. Also Baron Matello figures that an impregnable fortress is pretty cool and he wants it. So now we enter the third part of the book, where Rachad cons his way into the Aegis and meets the Duke of Koss and his personal alchemist, Amschel. Amschel is a much better alchemist than Gebeth and is further along in his production of the Philosopher’s Stone. We learn this after a few more exposition dumps. None of this had anything to do with the plot, but that’s okay because we threw the plot out the window a long time ago. Amschel doesn’t pay any mind to the change of bosses and finally dismisses Rachad and all his students because he’s found the final ingredient to create the Philospher’s Stone and it’s dangerous to do it. He succeeds but his lab explodes. Everybody figures he’s dead. Rachad gives up on ever learning the secret and joins the army to kill some Kerek. Crappy non-endings make me mad. The book feels like three loosely-connected short stories got mashed together into a plot that didn’t come to any conclusion. Whole characters, sometimes viewpoint characters, vanished midway through after leaving the vicinity of Rachad, who did a lot less to move the plot along than they did. And then there’s this whole alchemy thing. At first it had me interested. I was intrigued by the idea of future-alchemy. It amused me when, during one long expository speech, Amschel was all “Can you believe that people used to think that the universe was made of these tiny things called atoms instead of the five basic elements?” It got old, though, and it seemed like less of a plot hook as the book went on. It was just there along with all the other concepts like etheric sails (we never heard about those again after the midpoint of the book). You might have noticed that I didn’t mention any of the female characters in the book. Well, there’s a reason for that. There was a single one and she lasted about four pages. She was the Baron’s niece and Rachad did the Horizontal Chicken Noodle Soup a few times before she disappeared from the book entirely. I absolutely hate that this book was so bad because I wanted it to be good and it even kept hinting at the possibility that it would stop messing around and get to the point already. Joachim didn’t like it either.